Cherry Creek is located 30 minutes west of Yosemite National Park, with some of the most difficult and exhilarating whitewater rafting in the Sierra Nevada. It takes many years of experience to acquire the skills needed to safely navigate The Creek. Floating the Cherry Creek run puts boaters on the leading edge of the sport. Here in Jawbone Canyon, the Tuolumne plummets at an average rate of 110 feet per mile over giant granite boulders torn from the eroded bedrock of the Sierra. In one mile-long section the river falls 200 feet. 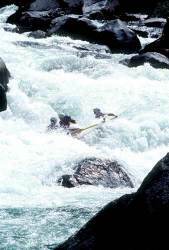 The mile-by-mile guide lists only the very toughest rapids. Aside from Lumsden Falls, the three most feared by whitewater rafters are Mushroom, Lewis' Leap, and Flat Rock Falls. But there are plenty of others difficult enough to cause trouble. Stop and scout whenever possible, even though this probably means contact with poison oak--another good reason to wear a wetsuit even in the heat of summer. Don't get over confident when you make it to the half-way point: the pools grow shorter and the rapids even more difficult the rest of the way. Be sure you recognize Flat Rock Falls (mile 6.8); most boaters wisely portage this dangerous drop. Lumsden Falls is even worse and should be considered unrunnable.